One of the best things about the coming of spring is all the fresh vegetables. One of my favorite things to do on the weekend is go to the farmers market without a grocery list and buy anything that looks interesting. Then when I get home, I plan my meals around all the new produce I've just bought. Sometimes I stumble onto some pretty interesting things. When I first picked up a large bag of stinging nettle at the market, there was a sign above them saying something to the effect of "CAUTION! Stinging nettles sting!" I thought it was a not-so-clever joke. So I bought a bag because it was quite cheap. Then when I got home, a quick search on Google for recipes taught me that whomever put up the sign was dead serious...oh silly me. Besides just being a healthy source of sustenance, apparently stinging nettle also has some useful medicinal purposes. Who knew that such a nasty plant could also be so nice? 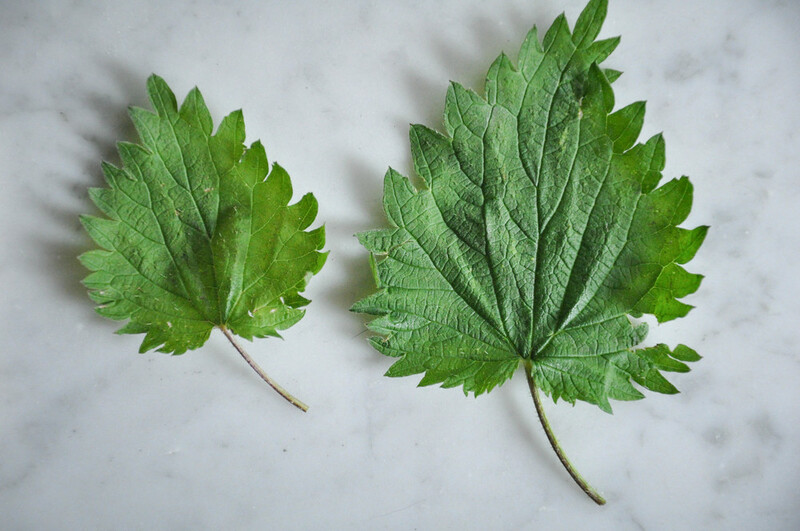 Most of the internet is in consensus that you can use stinging nettle as you would use spinach in any recipe. But I wanted to be a little more creative than...say...stinging nettle soup. Having made gnocchi once before in my life where it was a miserable disaster of gummy goop, I was a little wary, a little scared, but mostly determined. I think it turned out pretty well this time around. PLEASE PLEASE PLEASE do not use your bare hands to handle stinging nettle, it will hurt you, I promise. You can use gloves, or tongs & scissors as I did. After blanching for a few minutes, they lose their "sting." I made the mistake of boiling my potatoes as the cooking method. This introduced too much water to the potatoes and I had to use more flour than the recipe calls for to make the dough come together, which makes the gnocchi less pillow-y and a little chewier. It was still delicious, but baking the potatoes is definitely the way to go. Prick each potato a few times with a fork and bake at 350 degrees F for one hour or until very tender. In the meantime, trim the stinging nettle leaves off the stems. Discard stems. Blanch the nettle in boiling water for 3-4 minutes. Squeeze as much water as possible out of the nettle, I recommend using a cheesecloth. Pulse the nettle in a food processor for a few seconds until it's finely chopped, but not puréed. After the potatoes are cooked through, immediately spoon out the flesh into a large bowl and discard skin. Add the nettle and salt. Using a fork and spoon, mash and fluff the potato mixture until smooth. Let cool for 10 minutes. Add 1 & 1/2 cups of flour and the egg. Mix to combine. Continue adding in the rest of the flour as needed. Transfer dough to a well floured counter and knead until the dough is homogeneous, smooth, and pillowy. It should not be sticky. Unlike regular pasta dough, it is possible to over-knead gnocchi dough, so only work it as much as you need and no more. Using a pastry scraper, cut the dough into eight even pieces. Roll each piece into a skinny log about 3/4 inch in diameter, and cut the logs into 1 inch pieces. Optional: Flour the pieces of gnocchi so they don't stick. Taking a fork, roll each piece of gnocchi along the backside, creating ridges and a slight curl. Bring a pot of water to a boil and gently drop some gnocchi in. You'll know they're done when they begin floating to the top. Drain and serve with the sauce of your choice! If you are not making all of the gnocchi immediately, place the leftovers in one layer on a parchment paper lined baking sheet and freeze for 2 hours before transferring to a freezer bag. After cooking, transfer gnocchi to a hot frying pan with 2 tsp of olive oil. Get a nice, light brown on both sides. Turn the heat down to medium and add in two minced garlic cloves. Continue cooking for another minute. Add 2 tbsp of heavy cream and toss to combine. Transfer to a plate, sprinkle some Parmesan and fresh ground pepper and serve.